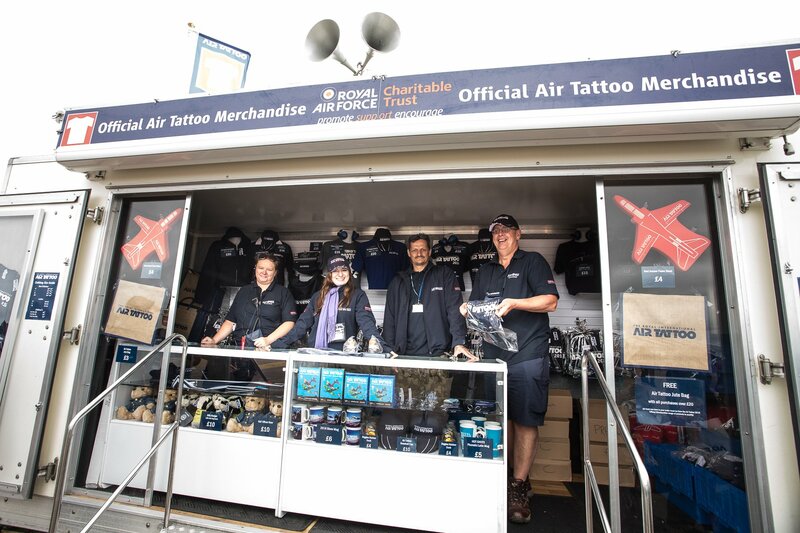 Merchandising trailer hire from TCM offers an ideal solution for temporary retail space to maximise spend – for example, at music or sporting events and airshows. 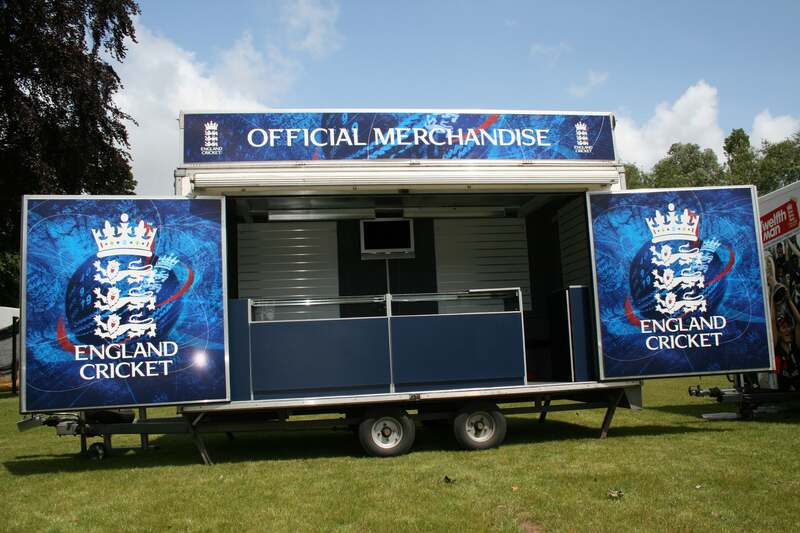 We have a range of merchandising/retail trailers available to hire on a long-term or short-term basis, providing an ideal base for ticket sales or to sell sporting goods, T-shirts, hats, hoodies and other merchandise. 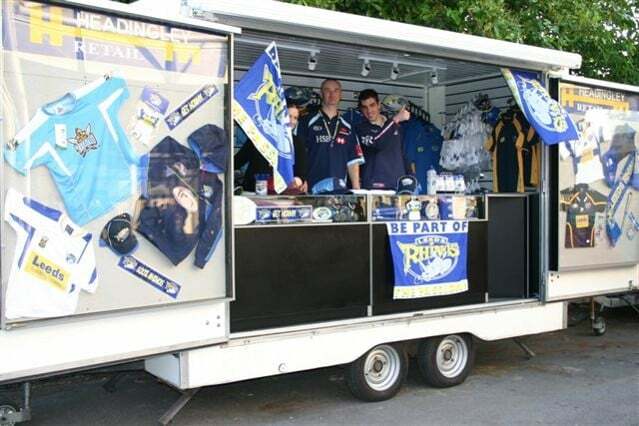 Merchandising trailers offer an ideal solution for a temporary or pop-up shop and you can fit the interior out just how you like. 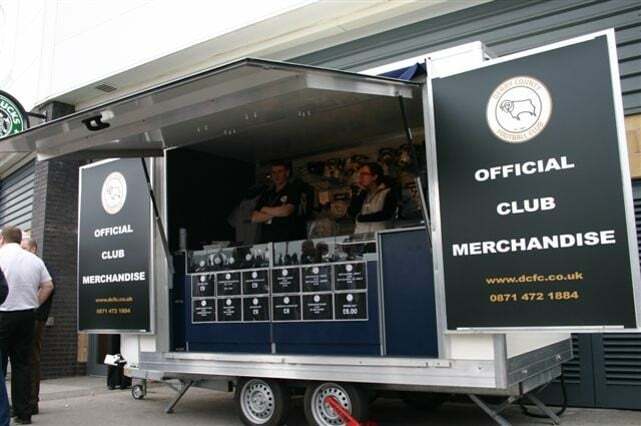 Our merchandising trailer hire prices include delivery and collection, and long-term hire can be an effective solution if you need to keep the unit stocked and ready to go. 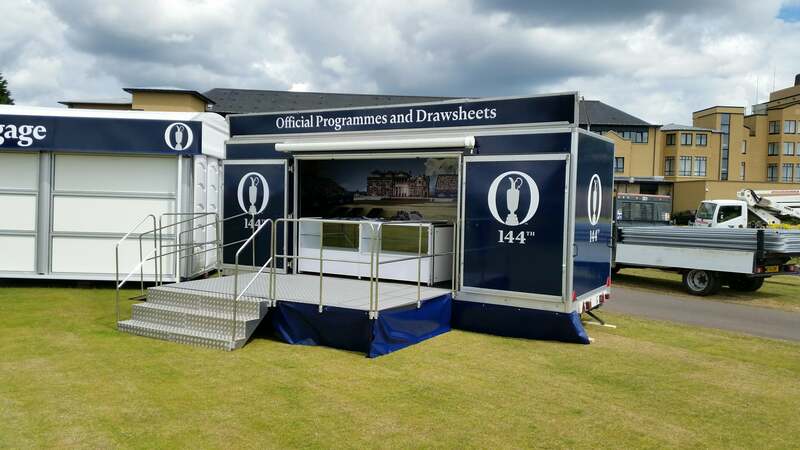 We have provided trailers for the Rugby World Cup 2015, Six Nations Championship, events at Wembley and Principality Stadiums and Blenheim Palace as well as football, cricket, rugby league and rugby union clubs. In February 2016 we were proud to provide trailers for the Liverpool vs Manchester City Capital One Cup Final at Wembley Stadium and supported the Carlsberg Trophy Tour prior to the European Cup – check out a famous former Spurs player being interviewed on our trailer below! 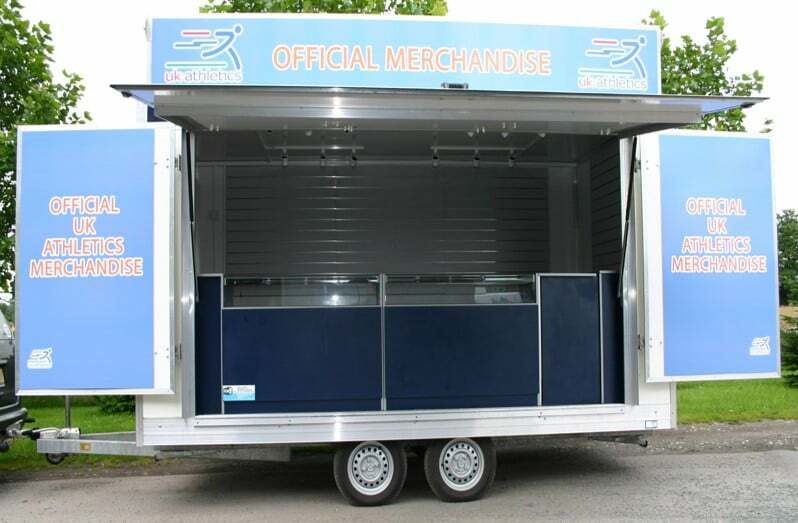 We have a range of merchandising units available from 3m/4.3m trailers with hydraulic lift-up or wind-out canopies which are ideal where space is limited, up to 6.5m trailers with more selling space available. The trailers are all fitted with wing panel doors with aluminium channel for foamex marketing boards. The trailer hire price includes retail counters across the front opening of the trailer and slatwall panels fitted to the internal walls. We can also provide internal furniture eg pigeon hole storage, bench seats etc free of charge – just add these to the booking form. Ask for specific trailer dimensions and the pitch sizes required. 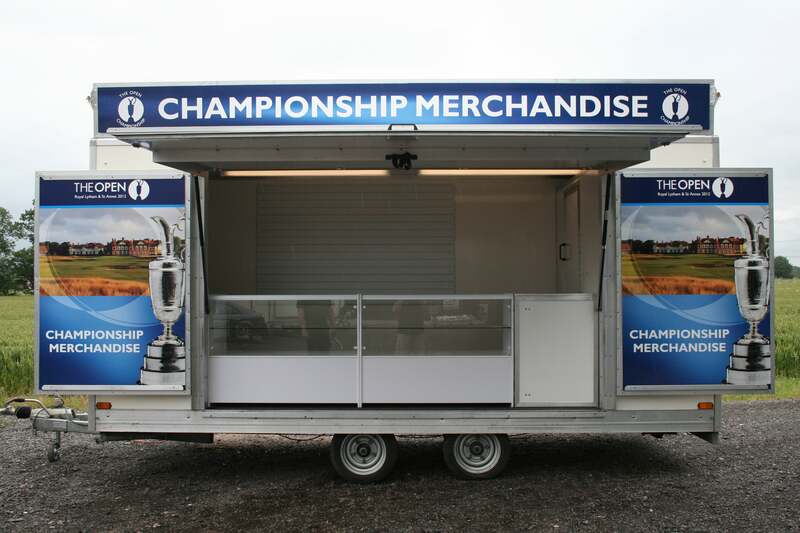 Merchandising trailers from TCM can be used either with retail counters across the front opening, so staff can stand behind to serve across the counter, or some clients prefer trailers to be set up as a shop that customers can walk into to view products. Just let us know how you envisage using the trailer and we will be happy to discuss your options. The internal walls of the trailer can be fitted with slatwall panels, for you to use your own eurohooks or shelving to display your products. Due to the huge variety of slatwall fittings used by our clients we don’t offer any slatwall fittings for hire, but if you need to purchase some we can provide a link to our supplier and just charge for any items you order at cost. For maximum impact, we offer a full trailer graphics/branding service. Prices start at just £350 plus VAT for the two wing panel doors at the left and right of the front opening, printed on to re-usable 5mm foamex panels. We store these between periods of hire so if you plan to use a trailer for an event in the future, this is a very cost-effective option. If your budget stretches to a full vinyl wrap, we can provide all the panel sizes your graphic designer needs and print and fit the vinyl prior to delivery. We print and fit from your own artwork, or we can put you in touch with design agencies who are experienced in working with trailers. Trailers can be equipped with generators or hook-up cables to power cash tills, lighting and heating. In addition, we offer LCD or digital screens for hire in a range of sizes, a range of iPad or product plinths and are adding to our accessories all the time so call us on 01543 546474 for up to date information. 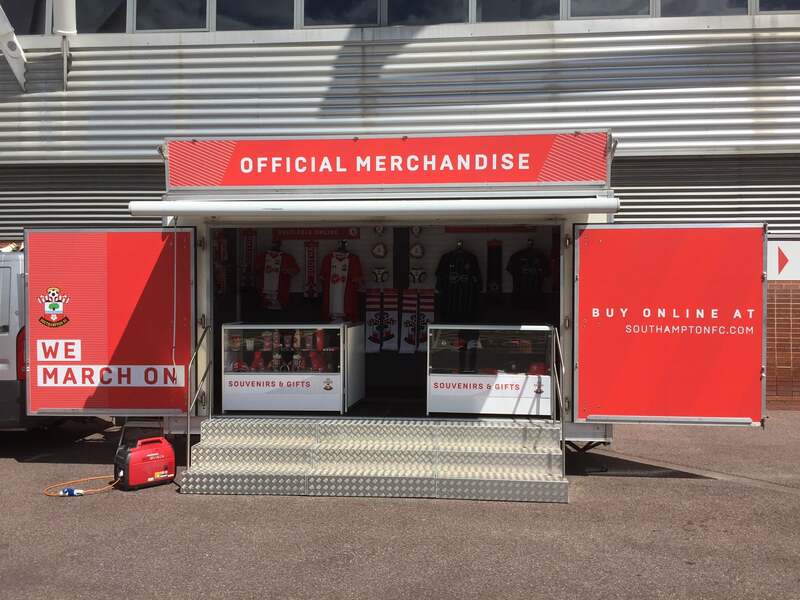 Typical prices for the different sizes of merchandising units are in the tables below, or call the office on 01543 546474 for up to date prices and availability on the full range of options. Prices quoted INCLUDE delivery/collection to any site in England or Wales. Contact us for prices for Scotland, Northern Ireland and Ireland. If you are considering longer-term hire, run a number of events throughout the year or are planning a trailer roadshow, discounts may be available. Call Lindsey on 01543 546474 to find out more. Self-drive hire is available subject to suitable vehicle, driver and insurance cover with collection from our conveniently located storage unit in Lichfield, Staffordshire in the heart of the Midlands. If you want to find out about how you can save money through self-drive options, call the office on 01543 546474.